The Miracle on the Hudson; the US Airways plane hit birds outside of the quarter-mile radius the FAA studied for the garbage facility. Incredibly, the Federal Aviation Administration (FAA) has ignored the lesson from that episode and approved construction of a garbage transfer facility, known as the North Shore Marine Transfer Station, in College Point, Queens, less than half a mile east of LaGuardia. Even though the facility is to be enclosed, the sight and smells of garbage passing through it will be irresistible to birds, as a possible food source, and are likely to draw birds into the path of approaching and departing aircraft, endangering the lives of passengers and people on the ground. The Bloomberg administration and the New York Department of Sanitation should never have proposed putting a bird-drawing garbage transfer station so close to an airport. But even more clearly, the FAA never should have allowed the project to go forward. 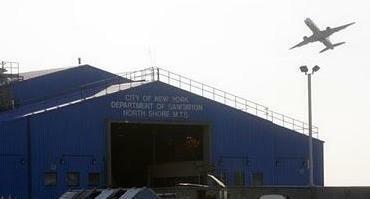 North Shore Marine Transfer Station, located very close to LaGuardia flight path. The Friends of LaGuardia is calling on the State Department of Environmental Conservation to revoke or suspend the permit allowing the garbage transfer facility to be located several hundred yards from the runways on the grounds that the trash would lure fowl and cause bird strikes. FAA guidelines normally call for a minimum of 10,000 feet between a “bird attractant” like this garbage-transfer station and an airport runway, yet the proposed station is being built about 2,200 feet from runway 13/31 at La Guardia. Moreover, each runway has an FAA-mandated protection zone, a safety buffer that must be kept clear of aviation hazards, including structures. Given plans drawn up by the Port Authority of New York and New Jersey, which runs La Guardia, that zone should be set at 2,500 feet for that runway – which would place the trash station squarely within it – rather than the 1,700 feet currently used. Rather than follow its own regulations, the FAA seemingly went out of its way to approve this facility. Initially, it failed to even consider the facility’s potential to increase catastrophic bird strikes to aircraft at one of the world’s busiest airports. Only under Congressional pressure did it finally conduct a bird-strike threat assessment. Usually, such studies examine a five-mile radius around the facility over a full year to assess all factors relating to weather, migration, available food and bird species diversity. But the official report of the study, submitted to the United States Department of Transportation by the FAA, presented data on bird activity only within a quarter-mile radius of the garbage facility, and indicated that the study was conducted over only two months, in the dead of winter. The project’s defenders have offered arguments that do not stand up to scrutiny. The city formerly operated a garbage transfer station at the same location, without incident. But the margin of safety for aviation is necessarily small; the fact that no one was killed because of a bird strike there before is no more persuasive than an uneventful car trip in which no one wore a seat belt. 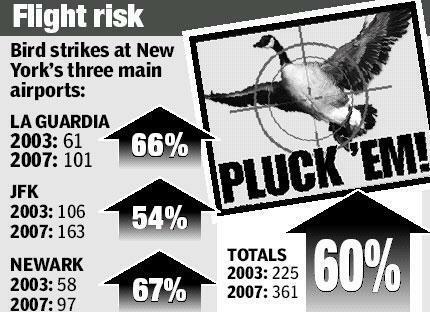 While the FAA panel recommended mitigation measures like a plan to reduce the hazards associated with wildlife – an implicit acknowledgement of the potential dangers – bird strikes around La Guardia have been increasing for years despite such steps. The proposed station is designed to be “enclosed.” But a recent FAA-sponsored study found that transfer stations that were fully enclosed were just as attractive to birds as those that were not. It’s true that the birds that brought down Flight 1549 were migratory geese, not birds residing in Flushing Bay, which surrounds La Guardia. But the Flushing Bay area is a haven for geese and other bird species and, in any event, the birds that brought down Flight 1549 could just as well have been resident gulls, which can weigh three pounds, more than large enough to disable an aircraft engine. This garbage facility is not just a safety hazard. Its proximity and height would prevent the Port Authority from using new navigation equipment when clouds are low in the sky and visibility is poor. That equipment is vital to reducing delays and increasing capacity; La Guardia is among the worst airports in delays and cancellations, with huge costs. The FAA and the Port Authority should prevent the construction of this threat to public safety and economic well-being. If they don’t, Govs. Andrew M. Cuomo of New York and Christopher J. Christie of New Jersey need to step in. If not, we will be left praying for another miracle on the Hudson. Byline: Now a safety and crisis management consultant, Hall was chairman of the NTSB from 1994 to 2001. This commentary was first published in the NY Times on 28 June 2011.